Chrysler made one of the past decade's strongest design statements with the 2005 introduction of the 300. The rear-wheel-drive sedan with blocky styling was a knockout with both the general consumer and, maybe more specifically, the aftermarket. Five years on and the 300 is still a SEMA favorite. Sometimes, modded 300s look pretty swank. Of course, sometimes not so much. If you're standing in Chrysler's shoes, obviously you want to muscle in on this market. Meet the 300 S6 and 300 S8. Essentially, these two cars are appearance packages. However, we think they're great looking appearance packs. 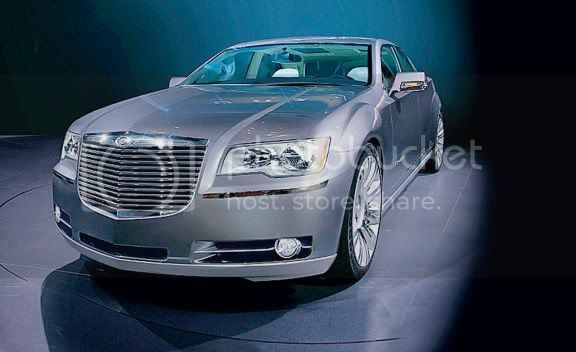 A new version of one of Chrysler's biggest hits, the 300, is expected next year. The higher-end sedan, introduced in 2004, was supposed to herald a new age for Chrysler. Its brash, chest-out look was a marked change from the sloping, futuristic designs the brand had previously been known for. It wasn't uniformly loved, but it got attention and brought in buyers. The 300 looked much more expensive than it was, and it drove like a pricier car, too. The flagship 300C version also had the famously-named Hemi V8 engine that gave it surprising power. The 300C won all kinds of awards, including Motor Trend Car of the Year, and Chrysler still boasts that it is the "most award-winning car in history." DETROIT - Redesigning an iconic car is a challenge, one faced by Chrysler LLC designers as they work on the next-generation 300 sedan. Feb.8th, 2006: Stainless Rear Bumper Caps QA, a division of Quality Accessories is now offering Stainless Steel Rear Bumper Cap Trim for Chrysler 300 (Base, Limited Touring editions). The Bumper Caps are made of 304 Stainless and feature a mirror finish. The Company says the Bumper Caps is a 3 "FLAT" Piece trim and is designed to fit the top Bumper surface similar to the 300C. Feb.6th, 2006: Bentley Style Headlight Covers for Chrysler 300 (all models) and Chrysler 300C by G Composites. The new style Headlight Covers is constructed of a very strong, but thin lightweight ABS Plastic for easy installation. The Light Covers are installed using Velcro for installation with no drilling or alteration. EZ-On EZ-Off installation. Strada "Hood" and "Venti" Chrome Wheels: Strada Wheels has announced the addition of the "Hood" and "Venti" Wheels to its extensive list of Custom Wheels for the Chrysler 300 and 300C models. Strada is offering the Wheels in 20x8.5 and 22x8.5". The wheels will be offered for the Rear Wheel Drive and All Wheel Drive models. Car Cover. This is one of the most popular auto accessories, especially for those who do not own a garage or carport. A car cover can protect an automobile from inclement weather and even from the occasional flyover of a bird. However, when purchasing a car cover, be sure to read the instructions carefully to avoid damaging the car or having the paint peel off from an improper application. Seat Cover. One of the most popular auto accessories for your car's interior is a seat cover. They can help to protect your car's original seats from stains, cigarette burns, tears, etc. Steering Wheel Cover. This product, which is designed to provide improved grip on your steering wheel, is created to help your interior in a number of ways. If you purchase a cloth steering wheel cover, it will protect your hands from grabbing an otherwise hot steering wheel after your car has been sitting in the sun. Additionally, a steering wheel cover is one of the more popular auto accessories because it helps to protect the steering wheel from scratches. Floor Mats. Every automobile is susceptible to dirt, mud and anything else on the bottom of our shoes. In an effort to keep the floor clean, mats are ideal auto accessories. Handheld Vacuum. Not commonly thought of as auto accessories, handheld vacuums are essential to keeping your interior clean. These handy little gadgets are ideal for cleaning seats and the floor of your car. Hands-free Cell Phone Connector. Although it is not recommended that anyone drive while talking on the cell phone, there are often emergency situations or calls that need to be addressed and this is why a hands-free cell phone connector is one of the best auto accessories that you could have. Rather than shuffling for the phone, using a hands-free connector is much more convenient and will not distract you from driving. Cell Phone Charger. This is one of the essential auto accessories if you own a cell phone. A cell phone charger connects to your phone and also to the cigarette lighter in order to recharge your cell phone's battery. If you happen to encounter car trouble on the highway only to find that your cell phone battery is empty, you will be glad to have this handy little device to give you instant use of your cell phone. Emergency Battery Charger. Owning one of these auto accessories could be one of the smartest purchases you make. They are charged at home using a regular outlet, then placed in your car. If your car's battery runs down, you are out of luck unless you have an emergency charger. These will help get you back on the road quickly and without the help of a tow truck. Child safety seat. If you have a child, the proper safety seat is a must-have for traveling. While you are on the go, you want the little one to be safe right along with you. A child safety seat is one of the best auto accessories in existence for both you and especially your child. Harness seatbelt for your pet. If you have to take your pet to the veterinarian or on a road trip, but have difficulty finding a travel crate large enough to fit him/her, a harness-style seatbelt for your pet will be ideal for keeping your pet in the seat and will prevent it from wondering aimlessly throughout the automobile. This can be both distracting and dangerous to the driver and other pedestrians on the road. Showtrix Does Size Really Matter? 18": Shotcalla aka "Peyton Manning"
21": Bling Bling aka "Dion Neon Sanders"
22": Major Playa aka "Emith Smith"
24": Top Dogg aka "Bow Wow"